Hello all, we’re back aboard Idyll Time. 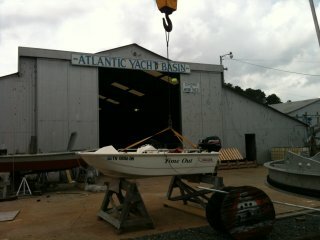 After patiently waiting on us for the past four months in her shed at Atlantic Yacht Basin, IT is ready to move south. A little dirty, but other than that she looks great. 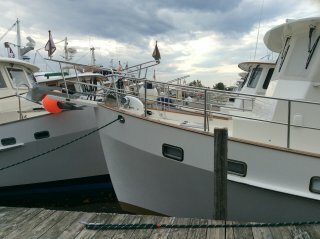 Jeff came up a few weeks ago for a haul out and bottom paint. He never lets anyone haul her out without us being there. 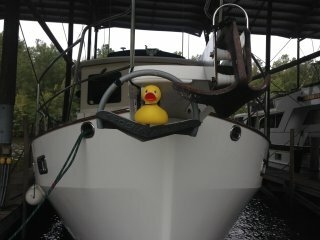 While out of the water, we also had the hull waxed. Now she looks even better. 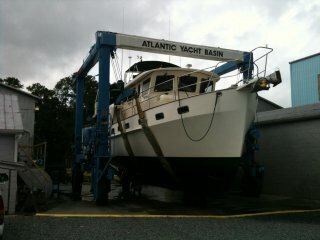 Time Out also gets serviced with an oil change and new fuel filters. AYB also replaced all five of our raw water strainers with new Groco brand strainers. Our original ones were installed in Taiwan while the boat was being built. One has developed a leak and needed to be replaced. After learning that parts for the Taiwan brand were not available, we decided to replace all the strainers with Groco. These are standard now on all the Krogens. AYB also replaced a leaking hydraulic hose for our port stabilizer. Before casting off the dock lines, we make a road trip in the RV up to Solomon’s, MD where the annual Krogen Rendezvous is taking place. It has been seven years since we last attended one of the Rendezvous and there are many new faces. We enjoy meeting all the new Krogen owners as well as re-establishing old friendships . The four day event is filled with lots of interesting seminars along with a catered dinner each evening. 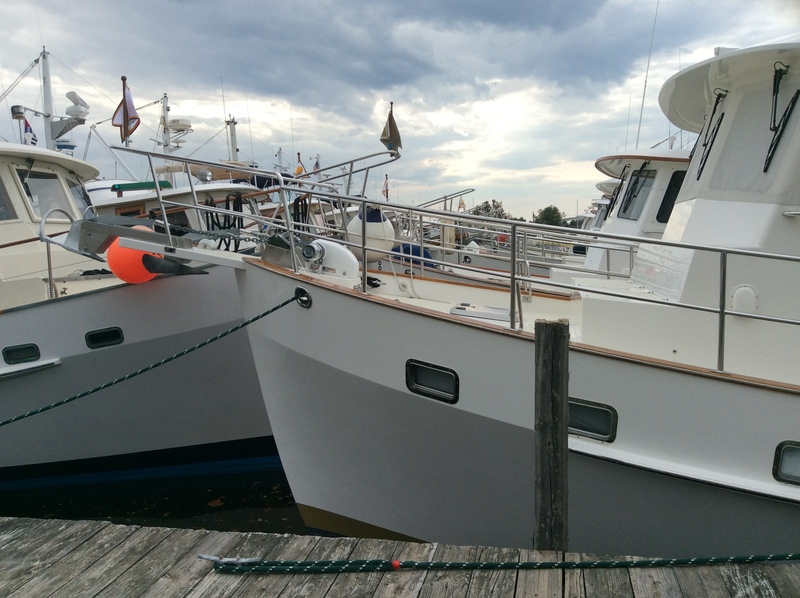 Turns out one of the raffle prizes was one month’s free dockage at Atlantic Yacht Basin which we won. How lucky is that? The $500 value more than pays for our trip. Back at Atlantic Yacht Basin, we make final preparations for our journey south. Jeff changes all of the impellers and test runs all of the systems. Everything seems to be working great! One last trip to the grocery store and our ship stores are chock full. 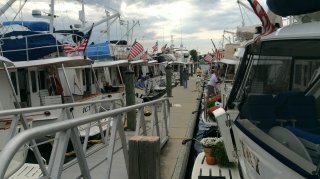 In just a few more days we will be back on the water. 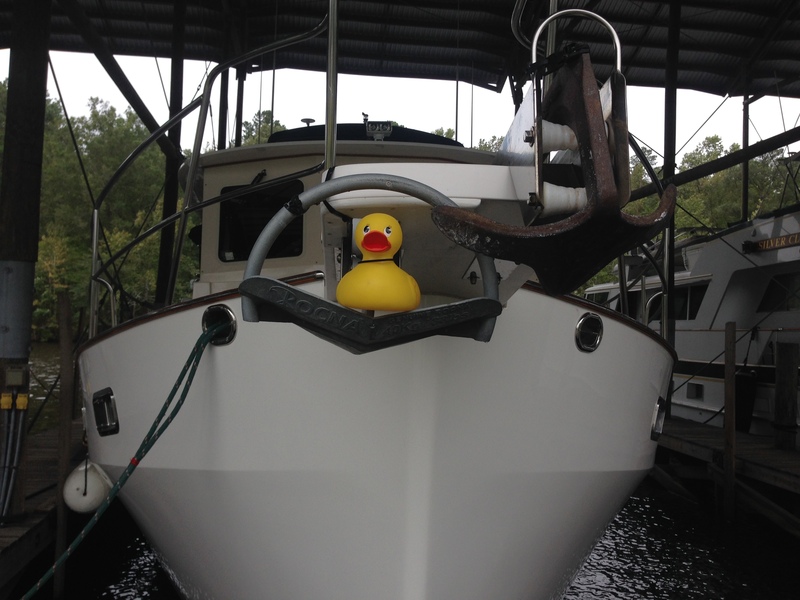 We have a new crew member aboard his fall. Meet Manny, our anchor locator. This entry was posted on October 16, 2015 at 4:03 pm. You can follow any responses to this entry through the RSS 2.0 feed. You can leave a response, or trackback from your own site.